A dish that will be an absolute staple! Prick the sweet potatoes on all sides with a fork. Place the sweet potatoes in the oven and roast until fork tender, about 45-50 minutes. remove from the oven and allow to cool. Once cool enough to handle, scoop the filling into a bowl and mash until smooth. Season with salt and pepper, set aside until ready to use. Heat a large saute pan over medium-high heat and add olive oil. Add the peppers and onion and cook until slightly softened, about 4 minutes. Add the garlic, chili powder, cumin and cayenne and cook for an additional 2 minutes. Add the corn, black beans, and wild rice and cook until just warmed through. Season with salt and pepper to taste. Reduce the oven temperature to 400ºF. In the bottom of a 9×13-inch baking dish, spread half of the red enchilada sauce. Using one tortilla at a time, spread a couple of tablespoons of the sweet potato puree. Top with the some of the wild rice mixture down the center. Roll the tortilla like a cigar and place seam-side-down in the baking dish. Continue with the remaining tortillas to make two rows of five enchiladas. 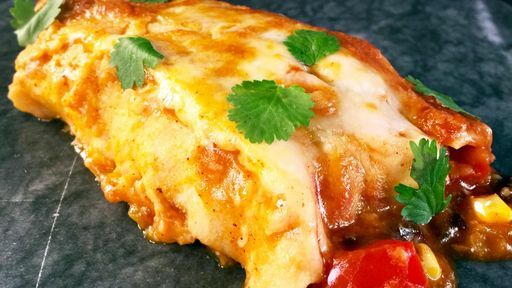 Pour the remaining red enchilada sauce over the top and sprinkle with Monterey Jack cheese. Bake for 20-25 minutes. Remove from the oven, allow to cool for 5 minutes and garnish with cilantro. Tip: Make it your own! Stuff the enchiladas with your favorite combination of vegetables and/or protein!